Looking for the perfect spot to say ‘I do’ in Durham? Here are 10 unique venues for a Bull City wedding. With its elegant brick walls and picturesque lights, no venue could be more Durham than the Cookery. Incubator of local businesses such as Ponysaurus, Pie Pushers, and the Parlour, the Cookery is teeming with living history. Even the bar was made from repurposed materials from around Durham. The Cookery now offers several large event spaces, including its front room, ballroom, garden, and courtyard. You can finish your big day with a visit from the Parlour’s Ice Cream truck! Home to several galleries and event spaces, the DAC building is a beautiful historic option for your wedding day. Built in 1906, the building sits in a convenient downtown location, close to many hotels, bars, and eateries. The large windows and Durham Civil Rights mural make for vibrant photo backdrops. In walking distance to Fullsteam, Motorco, and other great DIY district bars, the Rickhouse sits in the center of one of Durham’s most vibrant neighborhoods. This gorgeous revitalized warehouse boasts several surprises, including its own adjacent distillery. Invite your guests for a cocktail hour on a private patio overlooking the old DBAP! The Rickhouse can accommodate guest lists of many sizes and it offers a wide variety of vendor options. A centerpiece of Durham culture and community, Durham Central Park is the perfect outdoor venue for your wedding day. The iconic lawn provides a gorgeous green space for photos and a ceremony, and the covered pavilion transforms into your dance floor. The Cotton Room is a historic wedding space for an event of any size. With its floor to ceiling windows, wooden floors, and fantastic lighting options, this Golden Belt building could be the venue of your dreams. The Cotton Room offers a variety of unique menu and bar options including late night bites and sweet send-off treats! In the ballroom you can keep the large space open or separate with your choice of drapery. You might have visited this unique art gallery on a Third Friday in Durham. Spectre Arts is a revitalized gallery space in the growing Golden Belt District. Outdoor and indoor reception options are available, and the building’s mural decor makes for one of the most colorful wedding spots in town. One of Durham’s newest wedding venues, the renovated John O’Daniel Exchange now houses The Wedding Exchange. A versatile space a block from Durham’s SEEDS, this fantastic location is ideal for an intimate ceremony and reception. Dreaming of a DIY wedding with personal touches? The Wedding Exchange could be the venue for you. Fancy a cocktail made from ingredients frozen by liquid nitrogen? How about a dance party around a lunar lander? What about a private butterfly release after you say your vows? Durham’s Museum of Life + Science will rearrange its space and exhibits according to your needs, making it a perfect venue for science enthusiasts, young and old. Pine & Poplar is an extension of Durham’s newest wine store and bar, The Wine Feed. This brand new venue is now open for booking! A map of Durham and an Instagram-worthy sprawling white tree extend from floor to ceiling as part of Pine & Poplar’s unique decor. More than just a wedding venue, this gorgeous space teeming with Southern charm can be anything you want it to be! I mean look at this place! It’s one of the dreamiest places in Durham to tie the knot. Weddings can be booked only one year in advance of the wedding month so camping out to secure a wedding date may be in order, but hey, can you say worth it? Note: In order to schedule a wedding, blessing ceremony, or reaffirmation of wedding vows, one member of the couple, or one of their parents or grandparents should be a current full-time Duke student, a graduate of Duke University, or a current full-time Duke employee. This article was contributed to Best of the Bull by the incredible, Sarah Lasseter! If you’re interested in writing for us, visit this page! A Virginia native and a UNC grad, I found my way to Durham in 2013 after returning from two years in the Peace Corps in West Africa. Now I work as a high school science teacher in RTP. Next to running, exploring Durham is my favorite hobby! My husband and I fill our weekends stalking food trucks, bouncing around breweries, and patronizing new eateries. Join our Mailing List. It’s good. We promise. 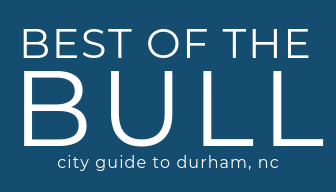 Secrets, favorites, tips and fresh ideas for enjoying daily life in and around Durham, NC.